One of the largest natural harbors in the world, Istanbul's Golden Horn, or Haliç in Turkish, meanders 7.5 kilometers, cutting into the European side of Istanbul where the Bosporus meets the Marmara Sea. Splitting the oldest section of Istanbul in half, the estuary was formed when valleys fed by the Alibey and Kağıthane streams flooded eons ago. 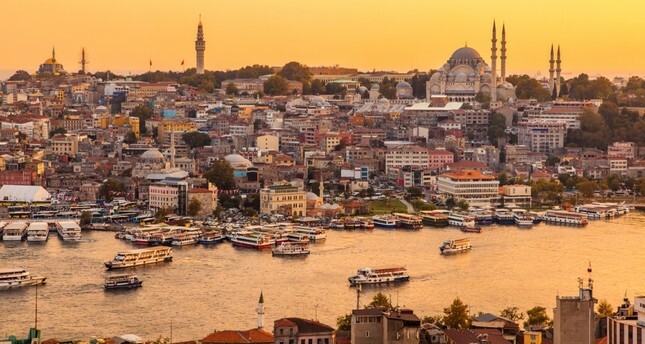 It now defines the city's peninsula, home to "Old Istanbul," where Topkapı Palace, Hagia Sofia, the Grand Bazaar and other famous structures still sit. Serving as the city's main harbor for centuries, it was once a center of shipping, trade and defense for many great settlements, including the Byzantine and Ottoman empires. Crucial for trade and a strategic military base, maintaining control of the harbor's entrance was essential. After Constantine the Great declared Constantinople the capital of the Roman Empire in the fourth century, he established the imperial navy's headquarters on the famous harbor and built almost 20 kilometers of double-layered walls along the shore to ward off attacks - making it nearly impregnable. To protect the vulnerable waterway itself, a massive floating chain spanning the 1,600-foot mouth of the harbor was used to hinder enemy ships. Over the years, how often the chain was actually put to use remains a mystery, though four instances during sieges in 821, 969, 1203 and 1453 are recorded in surviving historical documents. Comer Plummer's essay based on the research of Byron Tsangadas, author of the book "The Fortifications and Defense of Constantinople," describes one of the many versions of the chain: "Made of giant wooden links that were joined by immense nails and heavy iron shackles, the chain could be deployed in an emergency by means of a ship hauling it across the Golden Horn from the Kentenarion Tower in the south to the Fort of Galata on the north bank. Securely anchored on both ends, with its length guarded by Byzantine warships at anchor in the harbor, the great chain was a formidable obstacle and a vital element of the city's defenses." During the city's 900-plus years under Byzantine rule, the Golden Horn's chains were only circumnavigated three times. First in the 10th century when the Kievan Rus dragged their boats out of the Bosporus, carried them around the Fort of Galata and then launched them in the Golden Horn; again in 1204 during the fourth Crusade when Venetian ships were able to break the chain with a ram at the point where it came ashore near the Tower of Galata; and most famously by Ottoman Sultan Mehmed II in 1453, when, after attempts to break the chain failed, his soldiers towed their ships across the north bank using greased logs - and soon after conquered Constantinople for good. Though over the centuries many impressive versions were crafted, the chain 21-year-old Ottoman Sultan Mehmed II bested in 1453 was comprised of 2-foot wrought iron links with hooks for attaching wooden logs for buoyancy. The design allowed it to be flexible but strong enough to snag ships trying to pass, buying time for the Byzantines to launch simultaneous attacks from the shore and off boats waiting just behind the linked barrier. Today, pieces of the last chain are scattered around museums across Istanbul, but the bulk of it is housed at the Military Museum in the city's Şişli district. The root of the word "golden" in the European name Golden Horn has been debated for years. Greek mythology's version of the foundation of Istanbul and in turn, the first-known naming of the harbor is a good place to start. According to the legend, the king of the gods, Zeus, fell in love with a mortal named Io. To save her and their unborn daughter from queen Hera's jealous wrath, he turned Io into a white heifer. Tormented by Hera, she was forced to wander in her bovine state, eventually crossing the Bosporus - a name that literally means "ox passage." After reassuming her original form, she gave birth to Keroessa, who would later go on to have a son, Byzas the Magerian, fathered by the sovereign deity of water, Poseidon. Byzas became the founder of Byzantium, the first known settlement on the Bosporus, in the seventh century B.C., and named the Golden Horn "Chrysokeras" - a word researchers think closely resembles "chrysopalae," which means "golden gate" in Greek - after his mother. Interestingly - and serving as evidence of the myth's timeline - recent construction of Istanbul's Yenikapı subway station and Marmaray tunnel unearthed remnants of ancient ports, storage facilities and fleets of trade ships dating as far back as 6700 B.C. A more terrestrial-based theory correlates the name with the spectacular way sunsets reflect on the surface of the harbor, making it look like liquid gold. This phenomenon has inspired artists, poets and writers alike and made the north end of the waterway a popular spot - then called Sadabad, now the Kağıthane district - for Ottoman state elite in the 1700s, who built mansions and planted large tulip gardens along its shores. This period was dubbed by the upper class as Lale Devri (the Tulip Era). In contrast, the same era was known as Sefahat Devri (the Debauch Era) by the lower class, who blamed the elite in love with costly parties and luxury of economic frivolity for the eventual dissolution of the Ottoman Empire. Another namesake tale revolves around not the water's reflective surface but what may lie in its depths. According to ancient rumors, once it was clear that Mehmet II would conquer Constantinople, Emperor Constantine XI loaded a ship with the empire's treasure only to have it sink near the mouth of the Golden Horn before it could reach safety - some stories even say there were seven ships, all lost at sea. Other theorists claim that the Byzantines threw so many valuables into the harbor to keep them out of Ottoman hands that the water glistened with gold. No historical evidence seems to back any of these tales, but it hasn't stopped centuries of treasure-hunting daydreamers from theorizing about them. The Golden Horn's beauty has inspired poems, paintings and literature. So much so, interested in a public works project launched by Sultan Bayezid II in 1502, Leonardo da Vinci sketched two aerial-view illustrations detailing a unique and stylish bridge to span the harbor. The Golden Horn Bridge or "Da Vinci Bridge" was the first of its kind, designed to span 720 feet; and if it had been built, would have been the longest bridge of the time. The bridge itself was to feature three arches, a technique finally accepted three centuries later as a highly effective design. Leonardo was so convinced his idea would work that he offered to come to Istanbul and build it himself. Unfortunately, like many of Leonardo's designs, his vision didn't parallel the available technology. The sultan simply dismissed the project as impossible and set the sketches aside. They were then forgotten for 450 years. In 1952, the original sketches and the artist's letter to the sultan, then gathering dust in the imperial archives, were re-examined and confirmed as the work of the master himself. The sketch, original letter and its Ottoman translation are currently still in Topkapı Palace archives but not currently on display.